With EverTrue's LinkedIn partnership, we are able to match your imported constituent records to their associated LinkedIn account and bring in that extra information to help round out their profile. How do we do this? EverTrue creates a one to one match from a constituent record to a LinkedIn profile based on the emails imported on their record (coming from your database). If no emails are imported for a constituent, we will be unable to make an automatic match. If emails exist on the record, we will run those through our system with LinkedIn to see if any of them match up with a LinkedIn profile. If we find a match, we'll bring it over into EverTrue! (Note that EverTrue uses a "first match wins" process, i.e. the first email we process that generates a match will be the one we link to.) In addition, once we've made a match, the social profile will stick to the record. Even if the email that was used to generate the match is wiped from the record, the match will remain. The only option to remove the match is to manually unlink the two. More on that below. If EverTrue was unable to make an automatic match to LinkedIn, have no fear! We have a nifty feature that lets you match them on your own by inputting the LinkedIn profile URL - keep reading below! On rare occasions you might see an incorrect match. Why you ask? Read more here. If you are seeing an incorrect match to LinkedIn, we can help with that. Just click here! If you are attempting to make a manual match and receive an error, it might be one of these issues. On any un-matched profile, open the "Actions..." dropdown menu in the top right of the profile and select "Match on LinkedIn." Additionally, there are several other places on a profile where you can match to LinkedIn - the LinkedIn icon near the constituent's name, the "Match on LinkedIn" button at the bottom of the Summary >> Bio section in View All mode, or under Discover >> Shared LinkedIn Connections. Once you have selected "Match on LinkedIn," you have the option to either open a LinkedIn search based on that constituent’s name or enter the constituent’s LinkedIn URL if already known. You can find the constituent's LinkedIn URL under "Contact and Personal Info" directly to the right of their profile. Once you have the correct LinkedIn URL, enter it into the text box given (i.e. 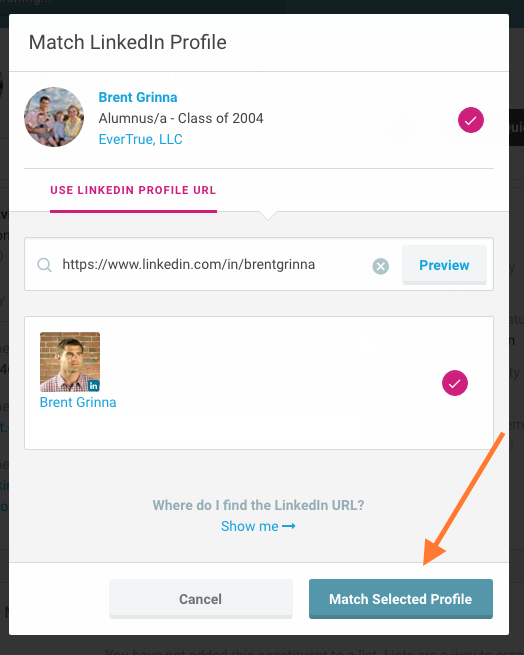 https://www.linkedin.com/in/brentgrinna) and hit Preview. Make sure to have the "https://" in front of the URL! Select the constituent and click “Match Selected Profile” to create the match! As a note, if you are attempting to match a constituent who is outside of the United States, please use the constituent's generic LinkedIn URL, i.e. the URL without the specific country designation/code. E.g. Do not use https://uk.linkedin.com/in/evertrue - instead use https://www.linkedin.com/in/evertrue, removing the country code near the beginning of the URL.